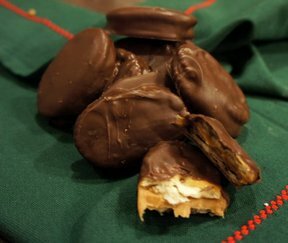 A peanut butter cup wrapped inside a peanut butter cookie? Who wouldn't love this! 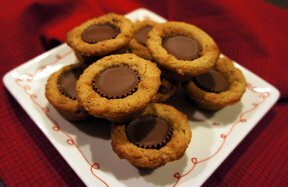 The cookie is soft and the peanut butter cup gets softened, too. Cream together butter, peanut butter, sugar and brown sugar. Add egg, mixing to combine. Add in flour and baking soda. Blend into creamed mixture. Drop into mini muffin tins. 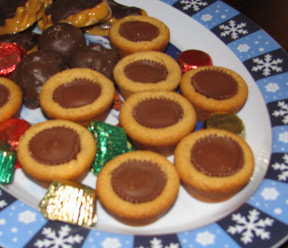 Bake 8-10 minutes at 375 degrees F.
Remove from oven and immediately place a peanut butter cup in the center. Allow to cool in pan. When cooled, twist cookie to remove from pan. 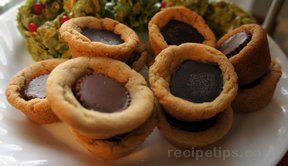 "I will be making these this holiday season since I love peanut butter cups and the soft cookie is just what I like."